You desire to know everything about phenibut and how effective it really is, right? 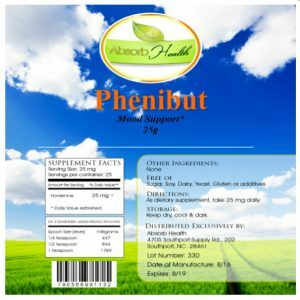 Well, my phenibut review will help you understand what the supplement really is, it’s mechanism of action, the recommended dosage, the benefits you get from it, the side effects, the best place order online and my final thoughts on the supplement. I hope this short but comprehensive review serves to be useful to you. Perfect! Let’s take a look at the phenibut supplement. How Much of it Should You Have? Phenibut is Worth the Try! 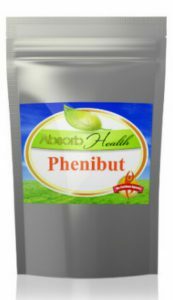 Phenibut is a dietary supplement that has been regularly used by folks to improve their general quality of sleep, depression, anxiety in social situations, and the general anxiety we usually get. (you know, like when you are about to sit for an exam you feel deep within that you haven’t really prepared for, and such). Actually, in Russia phenibut is used a prescription for anxiety. A good number of people in the united States use it for enhancing their daily performance. But there was a time this product had brought so much fuss in the US, around 2010 about being legal. However, it was sorted out and folks are still using it there. Even though I have seen people report of numerous benefits with phenibut, it is not really as popular as L-theanine and alpha GPC. It is well known by people who use it as a psychotropic drug that boost the overall functioning of the brain and get them more productive than they usually are. Other names of phenibut are noofen, Phenybut, phGABA and fenibut, 4-Amino-3-Phenylbutyric Acid, Beta-Phenyl-GABA, Phényl-GABA, phénibut, Agente Gabaérgico, B-Phenyl-Gamma-Aminobutyric Acid, Beta-phenyl-gamma-aminobutyric acid, Phenyl-GABA, Bêta-Phényl-GABA and Acide Bêta-phényl-gamma-aminobutyrique. Well, this product deals primarily with the brain. And it is able to reduce anxiety and boost cognitive performance as well as other noted benefits by focusing on a few parts of the brain. Be prepared, I’m about to get technical with the explanation. Although I’ll try to be simplistic. Okay? Phenibut has the advantage of being able to cross the blood brain barrier which makes the uptake of supplements with Gamma-aminobutyric acid (GABA) very hard. GABA is a neurotransmitter that is naturally found in the brain and is an inhibitor. A neurotransmitter is a substance that helps send signals to nerves across a synapse in the brain. When phenibut goes through the blood bran barrier and enters the brain, it gets GABA to make the channels in the neurons wide open, and then bring down the huge amount of activities of other neurotransmitters. This way, the anxiety that was going up is calmed down. This is how you relax after having a panic (anxiety) attack. It is also known that phenibut favors the production of more dopamine in the brain, which helps with improving your moods and keeping you happy. And it’s insufficient dopamine in the brain that brings about Parkinson’s disease. So supplementing with phenibut proves to be helpful with this condition. I took some time to see what people who have used and are still using phenibut were saying about it, and it’s quite clear they are loving it. Most people rated it with a 5 stars and 4 stars, which means it delivered completely to their satisfaction. Although, I did see a few complaints about it as well (mostly on reddit). While they didn’t give a reason as to why they didn’t love it, a good number may have taken the supplement without consulting with a doctor first, which could have caused problems. They might have had other medical conditions that could have made them see no good results or they might have been taking other medications together with phenibut, which is not recommended if you don’t have a doctor’s approval. That is why I keep on insisting, if you want to know how well any supplement will work for you, please visit a doctor first and get proper medical advice based on your current health condition. This product is really powerful, that is why I would advise people to start with a small dose and then slowly increase the amount with time and as they get used to it. Ideally, 250mg is the best place to start. Most people who have used it have reported great results with this. Although, there are some, a few, who have had to start way below this going up to around 100mg. Our bodies work differently, so you have to establish what fits you best. It’s half life is about 5 hours, and doesn’t last for more than 24 hours in the human body. It may also take a while before you feel the effects of it kicking in. If you take extremely high amounts of phenibut, you may feel drunkenness and may be even start staggering. This is at times accompanied by slight dizziness. A few people have reported other side effects like stomach upset, nausea and fatigue. You simply don’t want to overdose, you never know how your particular type of body may react. • Together with alcohol because of the possible synergistic effects. • If you are on any medications for any inhibitors of MAO or prescription drugs for epilepsy. • If you are pregnant or nursing. Basically, you should take the visit to the doctor very seriously as it will save you lots of hassles. 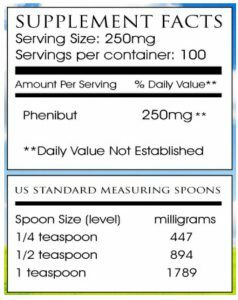 Make sure you don’t take phenibut on a daily basis, it is very addictive especially if you take too much of it. You can also develop tolerance and find it ineffective. Just take it when you need it, this it the best time. There are countless stores that sell various forms of phenibut. But the only store I have found to sell the best form is AbsorbHealth. This is a company that has come to gain good reputation within the nootropics industry over the few years it has been operating. They are the best to buy phenibut powder from. They don’t really sell capsules but in essence the powder is much better than the capsules. The customer service there is excellent and they will give you free shipping to UK, Australia, Canada, US and everywhere else in the world, if you make your purchases in bulk. If you want to know more about this store, you can read my absorb health review. And you are also going to find other people out there who have bought it recommending absorb health store. And you should also note that stores like Amazon, Walmart, gnc and a few others have removed this product from their stores. So you won’t find it. I find phenibut really great with anxiety and I believe you have seen that as well, especially in the way it works in the body. The benefits you get from it are awesome not to mention the well above average half life it has. So, personally, I do encourage you to give it a go and get to experience the benefits as well. Let me know your thoughts about it below.